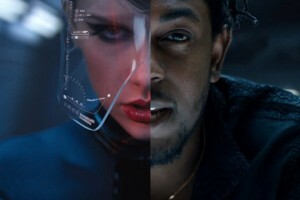 Taylor Swift is out for blood in the star-studded action-packed visual for her brand-new single "Bad Blood" featuring rapper Kendrick Lamar. The song was written by Taylor Swift and Kendrick Lamar together with Max Martin and Shellback. The track was produced by Max Martin, Shellback and Ilya and serves as the fourth single taken from the 25-year-old singer's critically-acclaimed fifth studio album '1989', released on October 27, 2014 via Big Machine Records. The cinematic music video was shot in the style of neo-noir action film by director Joseph Kahn in Los Angeles, California on April 12, 2015, but the setting for the visual is London's Liverpool Street. 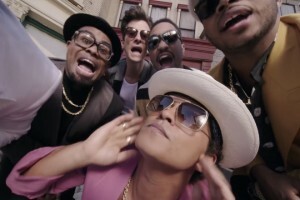 It was premiered on May 17, 2015, at the beginning of the Billboard Music Awards. It's filled with cameos from Taylor Swift's famous friends including guest feature Kendrick Lamar, Selena Gomez, Zendaya, Jessica Alba, Ellie Goulding, Gigi Hadid, Paramore’s Hayley Williams, Cindy Crawford, Lena Dunham, Mariska Hargitay, Cara Delevingne, Karlie Kloss, Ellen Pompeo, Hailee Steinfeld, Martha Hunt, Serayah and Lily Aldridge. Watch the girls embody their badass alter-egos as they show off their killer moves straight out of Kill Bill. We know that you can't get enough of the brilliant visual for "Bad Blood" and are dying to abuse the play button. We encourage you to watch it a few times. In order to help you memorize the song, we have provided you with the actual lyrics you can scroll through for ease of access. It is only natural that you leave a comment in the comments section. (A simple "Thank you" will suffice.) Better yet, share this video with all of your friends, so they can see it too. If you like Taylor Swift's music, then break open your piggy bank and buy it. The music video premiere of Taylor Swift's single Bad Blood ft. Kendrick Lamar has already been viewed 33,799 times since it was posted on Thursday, May 21, 2015. The video belongs to the music genre of Pop.